Although we did not go overseas during the June holidays, we tried our best to bring them out for outings & movies so that they would not feel so bored. 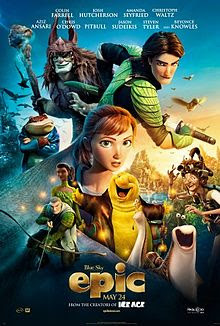 Epic cartoon was very nice surprisingly & all of us enjoyed the whole show. The kiddos enjoyed the Monster University movie. We went to watch the late night movie in JB and it was so cheap (only cost us RM$36 for 4 persons if you pay by Citibank credit card). Probably I was too tired that day, I actually fell asleep halfway through, ops! Personal advice: If you have a very young toddler/baby who can't sit still throughout the movie, try to select a timing that they are most likely to fall asleep or tire them out before the movie starts so that they will be able to sleep in peace during the movie screening. Worse come to worse, bring them out of the movie theater if they are really very noisy. I don't guarantee all babies/toddlers will behave the same way but I guess parents should know their children better than no one else.